In this lesson, we will learn how to use the Pythagorean identity and double-angle formulas to evaluate trigonometric values. 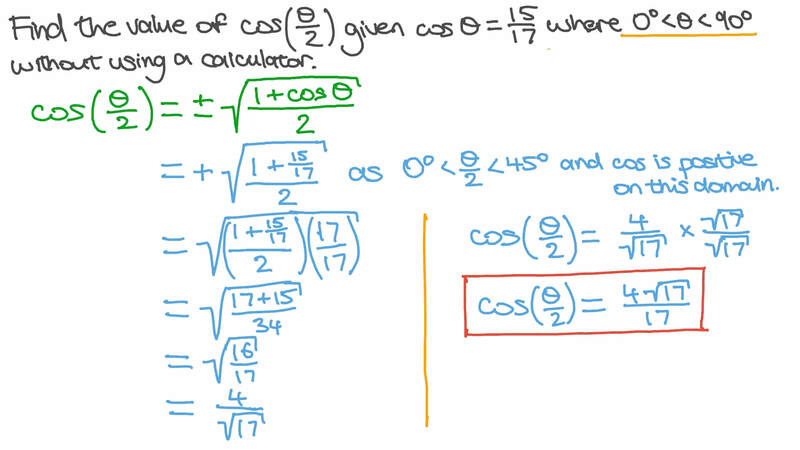 Find the value of c o s 2 𝐴 given c o s 𝐴 = − 3 5 where 9 0 < 𝐴 < 1 8 0 ∘ ∘ without using a calculator. 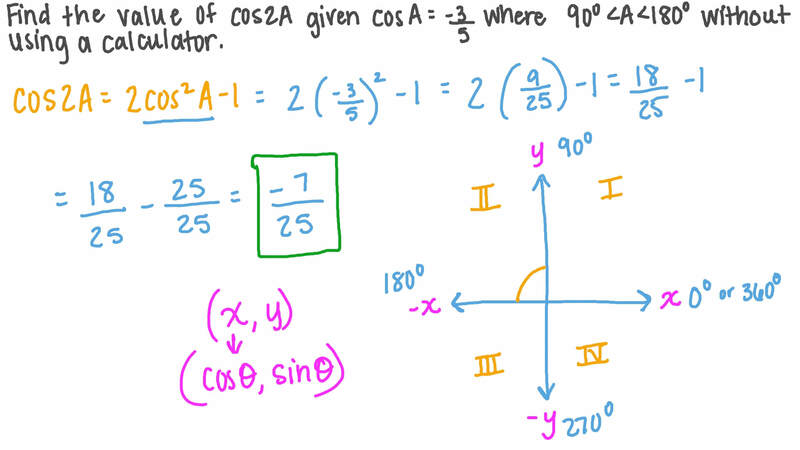 Find the value of c o s  𝐴 2  given s i n  𝐴 2  = 3 5 without using a calculator. Find, without using a calculator, the value of s i n 2 𝐴 given t a n 𝐴 = − 5 1 2 where 3 𝜋 2 < 𝐴 < 2 𝜋 . Find the value of c o s  𝜃 2  given c o s 𝜃 = 1 5 1 7 where 0 < 𝜃 < 9 0 ∘ ∘ without using a calculator. Knowing that 5 𝑥 + 1 2 𝑥 = 1 3 s i n c o s , find s i n 𝑥 and c o s 𝑥 . Knowing that 3 𝑥 − 4 𝑥 = 5 s i n c o s , find s i n 𝑥 and c o s 𝑥 . Find, without using a calculator, the value of s i n 2 𝐴 given c o s 𝐴 = − 1 2 1 3 where 1 8 0 ≤ 𝐴 < 2 7 0 ∘ ∘ . Find, without using a calculator, the value of s i n  𝜃 2  given t a n 𝜃 = − 1 5 8 where 3 𝜋 2 < 𝜃 < 2 𝜋 .
𝐴 𝐵 𝐶 is a triangle where t a n 𝐶 = 8 1 5 . Find the value of s i n  𝐴 + 𝐵 2  . Find the value of c o s ( 𝜋 + 2 𝐴 ) given s i n ( 2 7 0 + 𝐴 ) = − 1 5 1 7 ∘ where 3 𝜋 2 < 𝐴 < 2 𝜋 . Find, without using a calculator, 1 − 2 𝑋 1 + 2 𝑋 c o s c o s given t a n 𝑋 = 4 where 𝑋 ∈  𝜋 , 3 𝜋 2  . Which of the following is equal to √ 1 − 2 𝑥 s i n ? Use the addition formula to find an expression for s i n 2 𝛼 . Given that s i n c o s 𝑋 + 𝑋 = − 7 1 3 and 𝜋 < 𝑋 < 3 𝜋 2 , determine the possible values of c o s 2 𝑋 . Find the value of 1 + 2 𝐴 1 + 2 𝐴 s i n c o s given t a n 𝐴 = 5 2 6 where 0 < 𝐴 < 𝜋 3 without using a calculator. Find the value of t a n c o t 1 5 7 3 0 ′ + 1 5 7 3 0 ′ ∘ ∘ and then t a n c o t 2 ∘ 2 ∘ 1 5 7 3 0 ′ + 1 5 7 3 0 ′ without using a calculator. Find the value of s i n 4 𝑋 given 2 𝑋 𝑋 − 2 𝑋 𝑋 = 9 2 6 s i n c o s c o s s i n 3 3 . Find, without using a calculator, the value of t a n 4 𝑋 given s i n c o s 𝑋 𝑋 = − 1 4 where 𝑋 ∈  𝜋 2 , 3 𝜋 4  . Use the addition formula to find an expression for c o s 2 𝛼 . Which of the following is equal to √ 1 − 2 𝑥 c o s ? Using the half angle formulas, or otherwise, find the exact value of t a n  𝜋 8  . Find the value of 1 −   1 +   t a n t a n 2 7 𝜋 8 2 7 𝜋 8 without using a calculator. Evaluate 3 6 1 1 2 3 0 ′ 1 − 1 1 2 3 0 ′ t a n t a n ∘ 2 ∘ without using a calculator. Simplify t a n t a n 3 5 4 4 ′ 1 4 ′ ′ 1 − 3 5 4 4 ′ 1 4 ′ ′ ∘ 2 ∘ . 𝐴 𝐵 𝐶 is a triangle, where the ratio between its lengths 𝑎 , 𝑏 , and 𝑐 is 4 ∶ 3 ∶ 5 . Find t a n 2 𝐴 .